Various representations have been received seeking clarification on the procedure to be followed in respect of return of time expired drugs or medicines under the GST laws. The issues raised in the said representations have been examined and to ensure uniformity in the implementation of the law across the field formations, the Board, in exercise of its powers conferred under section 168(1) of the Central Goods and Services Tax Act, 2017 (hereinafter referred to as the “CGST Act”) hereby clarifies the issue in succeeding paragraphs. 2. The common trade practice in the pharmaceutical sector is that the drugs or medicines (hereinafter referred to as “goods”) are sold by the manufacturer to the wholesaler and by the wholesaler to the retailer on the basis of an invoice/bill of supply as case may be. It is significant to mention here that such goods have a defined life term which is normally referred to as the date of expiry. Such goods which have crossed their date of expiry are colloquially referred to as time expired goods and are returned back to the manufacturer, on account of expiry, through the supply chain. a) In case the person returning the time expired goods is a registered person (other than a composition taxpayer), he may, at his option, return the said goods by treating it is as a fresh supply and thereby issuing an invoice for the same (hereinafter referred to as the, “return supply”). The value of the said goods as shown in the invoice on the basis of which the goods were supplied earlier may be taken as the value of such return supply. 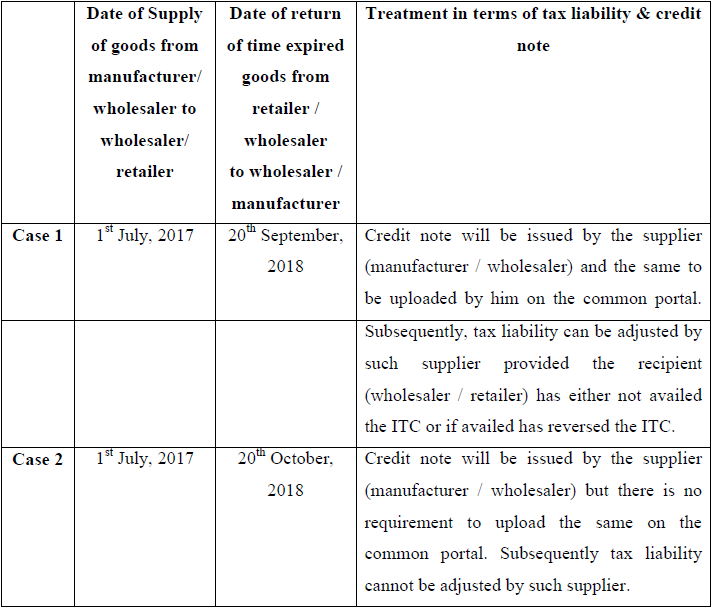 The wholesaler or manufacturer, as the case may be, who is the recipient of such return supply, shall be eligible to avail Input Tax Credit (hereinafter referred to as “ITC”) of the tax levied on the said return supply subject to the fulfilment of the conditions specified in Section 16 of the CGST Act. d) Where the time expired goods which have been returned by the retailer/wholesaler are destroyed by the manufacturer, he/she is required to reverse the ITC availed on the return supply in terms of the provisions of clause (h) of sub-section (5) of section 17 of the CGST Act. It is pertinent to mention here that the ITC which is required to be reversed in such scenario is the ITC availed on the return supply and not the ITC that is attributable to the manufacture of such time expired goods.